Siege Robotics is a FIRST (For Inspiration and Recognition of Science and Technology) Robotics Competition team in Vicksburg, Mississippi created in 2000. 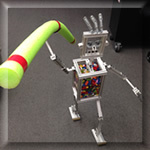 See what fun "Safety Nut" has had since his arrival at Siege Robotics' shop in Vicksburg! New Cartoons for Deep Space! 5 January - Deep Space Season Kicks Off! To all of our sponsors and parents for this season!